Book Signings at Sheraton Hotel, Agoura Hills, CA on weekend of Cassidy concerts! David Cassidy scheduled for concerts at The Canyon Club, Agoura Hills CA and The Grenada Theatre, Santa Barbara, CA. I will be doing a book signing at the Sheraton Hotel in Agoura Hills CA this weekend during the two days of Cassidy concerts scheduled for The Canyon Club on the 18th and Santa Barbara on the 19th. Two days of signings will be held at the Sheraton--February 18, 2-4PM and February 19, 11-2PM. The Full address and location: Sheraton Hotel, 30100 Agoura Road, Agoura Hills, CA 91301. Room 228. Hope to see some of you! 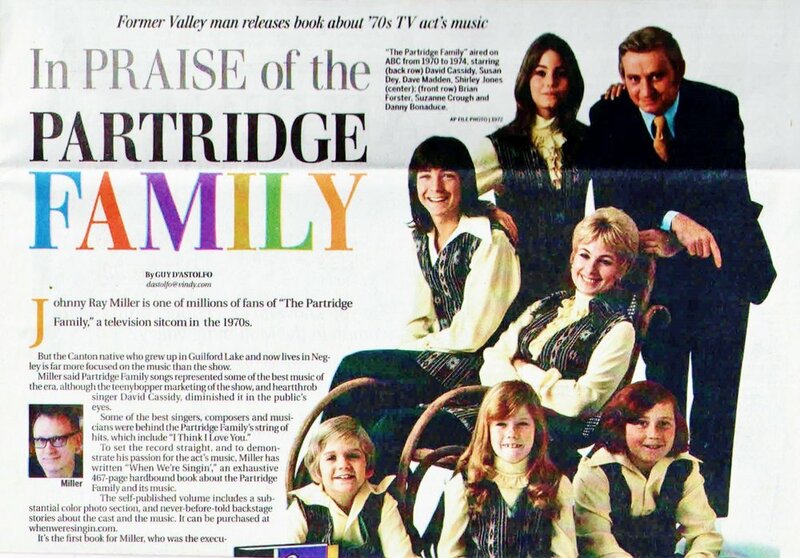 IN PRAISE OF THE PARTRIDGE FAMILY - a feature story in the Vindicator! In the meantime, I have sent out a survey form to all of my individual backers. This feature is only offered as a one-time feature through Kickstarter. It allows me to get your shipping address and your name, as you would like it to appear in print and on the website. I have saved the survey until now, knowing I can only do it once, because I wanted to send it out as close to the print date as possible. You should be getting it about the same time you receive this update! Once the text section is sent to print I can announce an exact release date, which will be approximately five weeks following the printing process because the book is being printed in the U.S.A., (as opposed to 4 months delivery time if it were printed in China or anywhere overseas). I know it has been a long wait for all of you, but I hope the added work on the book will prove worth the wait! I appreciate each and every one of you and all the support you have given me through this past year. Not just for the backing, but for all the kind emails and words of enthusiasm that you have sent as well! When We're Singin' explores the effort behind matching the image of the Television show to the sound of the music. While the producers and creators of the TV show were crafting the look and feel of the show, the music was being done at Western Recorders, Studio 2, and Wes Farrell was in charge. Farrell was highly driven, and it was his responsibility to come up with credible pop music, but it had to match the desired image of the show. He pulled the best musicians, singers and songwriters of the day into the project, and as a result the music was truly rooted in an adult contemporary, or easy listening sound. With the music as believable as the strength of its image created through the magic of television, (thanks to some really terrific actors and directors) the marketing of this product took off on an international roller coaster ride that proved to be bigger than any TV/Music marketing package ever created up to that point.